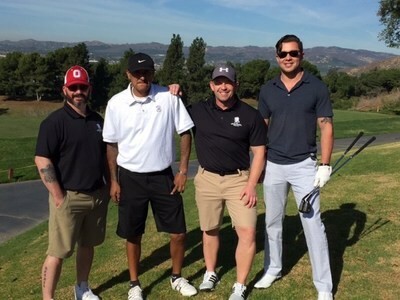 LOS ANGELES, Dec. 29, 2016 /PRNewswire-USNewswire/ -- A group of wounded veterans joined Hollywood celebrities during the 11th Annual Celebrity Golf Classic on the greens of Saticoy Country Club. Hosted by GOTT Entertainment, the tournament brought together actor Michael Pena ("Ant-Man," "The Martian," "Shooter"), Hall of Fame NFL running back Marshall Faulk, and Grant Show ("Devious Maids"), among others, to raise support for the wounded warriors, caregivers, and families Wounded Warrior Project® (WWP) serves. Army veteran and experienced golfer Ryan Fowler was one of the warriors in attendance. Golf is a sport that has had a significant impact on his return to civilian life. "Golfing is hugely therapeutic for me," Ryan explained. "I love being on the course and around fellow golfers, whether it's taking jabs at each other's swings or giving a fist bump for a great putt. I started playing golf a lot when I returned from Iraq in 2005 – there was something so calming about it. Without knowing exactly how much it was helping me then, I look back now and realize what a huge role it's played as an outlet that is challenging and constantly changing. No two games of golf are ever the same – that always gives me something to look forward to." The event itself was played in a shamble format, with teams hitting their first shot and playing from the best-positioned ball from that round. "I lost a few balls, I'm sorry to admit," Ryan said. "My teammates were very good golfers, and I learned a few things from them throughout the course of the day. It was definitely a more difficult course than I would normally look to play. And even being in the Los Angeles area, I was out of my element. But it's in those situations where you're in unfamiliar environments and don't know anybody that boundaries are stretched and growth occurs. Being around those other players only made it easier to face those challenges." Activities like playing golf and socializing with other veterans can help injured warriors cope with stress and emotional concerns. In a WWP survey of the injured warriors it serves, more than half of survey respondents (51.7 percent) talked with fellow Operation Enduring Freedom, Operation Iraqi Freedom, or Operation New Dawn veterans to address their mental health issues, and 29.6 percent expressed physical activity helps. "I know golf will be a lifelong activity for me, with how much relief it's already brought to my life," Ryan said. "I encourage all warriors I know to get involved with the game as well, if the interest is there. The event itself was great. All of us warriors felt welcomed and appreciated, and the celebrities and participants definitely showed their support for Wounded Warrior Project. They were really nice people and super down-to-earth. I had an amazing day." The tournament raised funds to support the mental health services, physical health and wellness programs, career and benefits counseling, and warrior community connection opportunities provided by WWP. Generous donors make it possible for wounded warriors to take part in outreach activities and benefit from program resources at no cost to them.